Bird of paradise (Strelitzia reginae), also called the crane flower, is part of the banana family and native to South Africa. The bird of paradise can reach a mature height of 4 to 5 feet, with thick, waxy green leaves and a large, striking, vibrantly-colored flower that looks like a flying bird. The canoe-shaped, leaf-like bracts are green, red and purple, up to 8 inches long, and sprout the bright yellow and orange flower petals. This tropical perennial plant blooms during the fall, winter and early spring, usually from September until May. Growing a bird of paradise from seed is a slow process and requires some pretreatment to get the seeds to germinate. 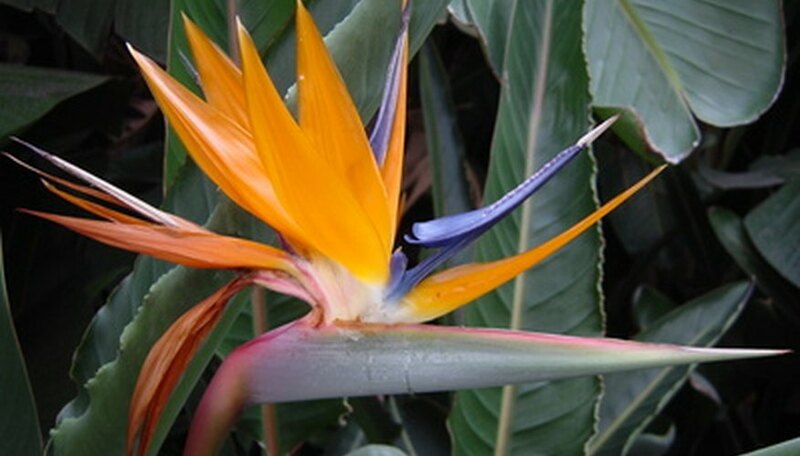 Soak bird of paradise seeds in lukewarm water for three to four hours. Drain away the water. Place the seeds into a plastic sandwich bag and store them in the refrigerator for about 14 days at 40 to 45 degrees Fahrenheit. Scratch or nick the hard outer layer of the seeds with the tip of a sharp knife to scarify them, a process in which you “wound” the seeds for them to germinate. Fill a seed tray with a 3- to 4-inch layer of vermiculite or one part peat moss mixed with one part perlite. Plant the bird of paradise seeds about 1/2 inch deep, spaced about 3 inches apart. Water the seed tray thoroughly and evenly moisten the potting mixture. Cover the seed tray with a clear plastic bag or tray lid. Place the seed tray in bright, indirect light. Water the seeds and soil mixture lightly and evenly every day to keep it damp until the seeds germinate, which can take two or three months. Transplant the germinated seedlings into individual 6-inch planter pots filled with a soilless potting mix after they've developed two "true" leaves. The true leaves emerge after the smaller seedling leaves. Don't allow the potting mix to dry out, especially while the seeds are germinating. Continue to water the seedling bird of paradise plants frequently and generously after your repot them into individual containers.